We were lucky to come across this flock of about 25-30 Blood Pheasants on the Gurudongmar Road between Lachen and Thangu. There had been fairly heavy snowfall overnight and it had started snowing gently just as we came across the flock – which was great as these are birds that tend to prefer the snowline. 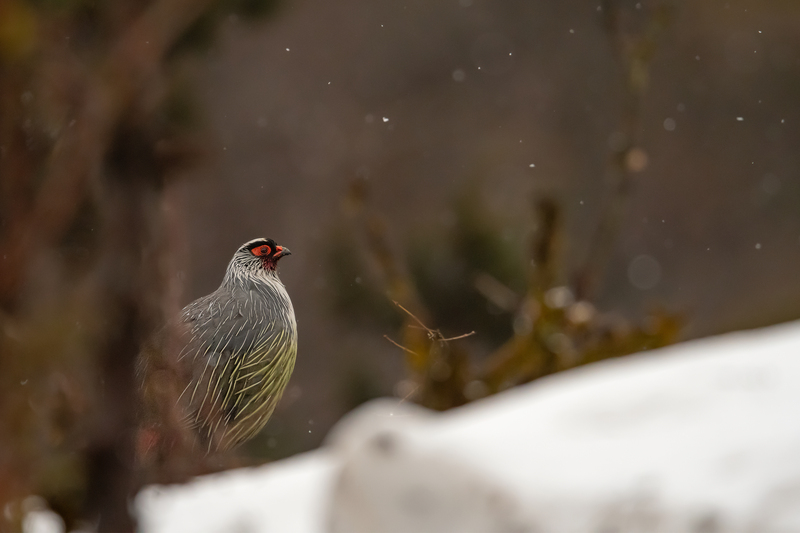 However, they were about 40m above us on the slopes and seemed to be moving further away – meaning that we had to brace for a steep climb on snow-covered slopes if we were to get a decent image of the bird. We were at 12,270 ft above sea level – even a short but steep climb, with the heavy 600mm bazooka was bound to leave me breathless. Hand-holding the camera was going to be a tough proposition as well – but there wasn’t any other way it could be done. Just the thought of getting an image of this beautiful bird was enough to get us climbing the slopes with scarcely any thought for the descent. There were a few times I nearly lost my footing and slipped, a few moments when I contemplated stopping and turning back and several perfect shots that I missed as I was busy catching my breath. 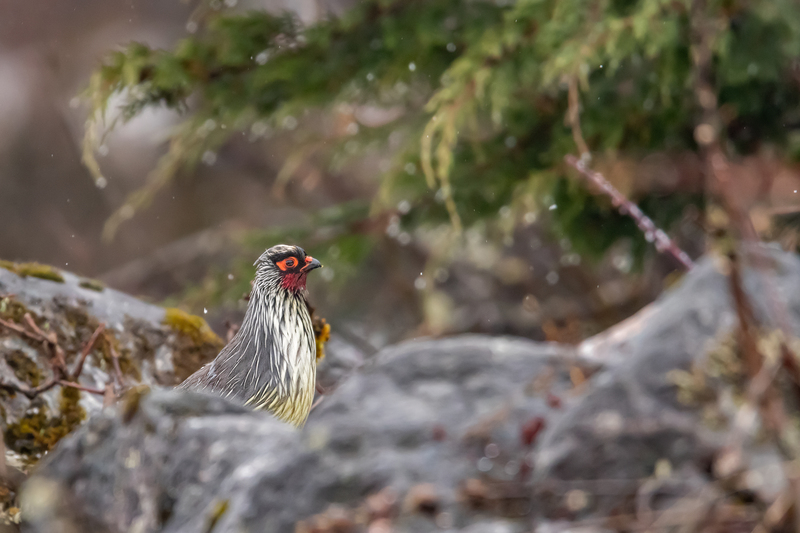 In the end though, this image of the Blood Pheasant just emerging from behind the trees with snow in the foreground and a few snow-flakes in the frame, made the effort worth the while.